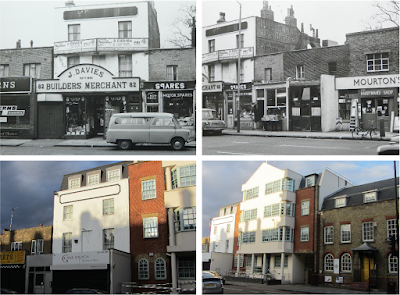 Oh dear I have fallen behind with these Holloway Road comparison photos; it appears the last one I posted was three years ago. The images shown below compare No. 82 Holloway Road in the 1970s with how it looked in 2013. As you can see, No.82 has not changed much at all over the years except that an extra floor has been added; even the the octagonal advertising space still remains. However, the 2-storey buildings to the right are long gone, replaced with The Richmond Fellowship building. And ooh how that Glam dogs 'logo' used to irk me. It looked like "G lam dogs".